We were both lucky and unlucky in admiring what is described as the most classic view in all China. 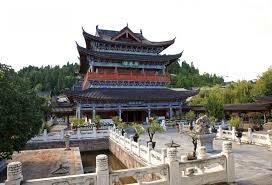 The Jade Spring Park was built in 1737 in the Qing dynasty. 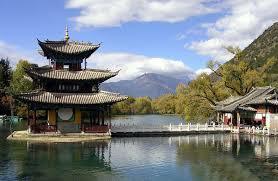 Its Kublai-Khan like atmosphere is enhanced by an artificial lake, pagodas and a wonderful five-arched bridge. The mountain is, in fact, a massif consisting of various peaks the highest of which, Shanzidou (18,360 feet), was first climbed in 1987. Shanzidou has not been climbed again since as the mountain is believed to be the home of the Gods and permits are not issued to preserve its sacred nature. Another peak in the massif, however, mount Satseto (Nakhi name) or Yulong (Chinese name) can be reached by cable car and offers good ski-ing and awesome views. Among famous travellers who have visited and fallen in love with the area are the botanist and explorer Joseph Rock (1884 – 1962) who wrote extensively about the Nakhi people, Bruce Chatwin and more recently Michael Palin. 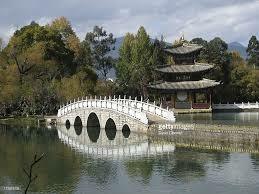 The Jade Spring Park is absolutely gorgeous and, naturally, a popular destination for Chinese courting couples. During our visit there were still many lovely flowers in bloom and the pavilions were enchanting. 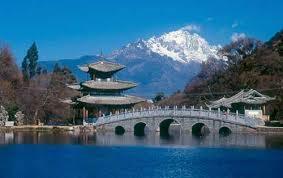 We could have spent ages in the countryside around Lijiang but time’s winged chariot was hurrying very near us….. I felt a bit like those three courtiers, Ping, Pong and Pang in Puccini’s masterpiece ‘Turandot’ when they sing nostalgically of their homes so far away from the imperial court. I’d just love to fly out again to this area again…and I will. When I gave my lesson on English Palladianism to Pisa’s Liceo artistico a couple of weeks ago and compared the Thames as a sort of river Brenta for eighteenth century aristocrats I clearly mentioned the obvious glories like Chiswick house and Marble Hill house. However, there are plenty more villas along or near the Thames west of London that may be not exactly Palladian in style but are equally fascinating and picturesque. I first discovered many of these houses as a teenager and it was a challenge I set up to myself to cycle from south-east London where I then lived and visit them all. There was, however, one house I never visited, Boston Manor, and the reason I gave for not seeing it was that its grounds were cut up by the M4 motorway (which, incidentally does a similar job to Osterley Park) and that it would, therefore, be a great disappointment. A very pleasant surprise awaited us. The house is a three-gabled grade one listed Jacobean mansion dating back to 1623 and originally owned by the Clitheroe family who sold it to the local council three hundred years later in 1923. Although the whole house is worth visiting what two features stand out most for me are the beautiful Jacobean staircase with trompe-d’oeil painted sides and an elaborate entry. 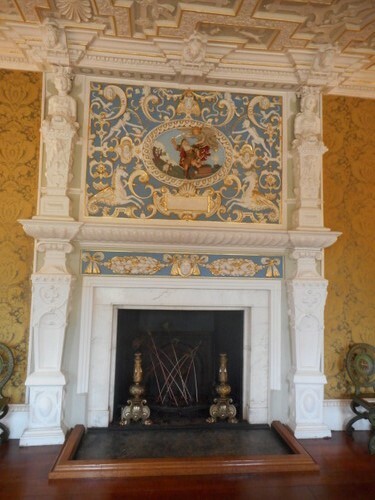 The chimney piece is equally elaborate with a depiction of Abraham’s attempted sacrifice of Isaac, based on a design by Flemish Abraham de Bruyn. It’s no wonder that Boston Manor’ wonderful interiors have been used for several costume-drama film and TV series. 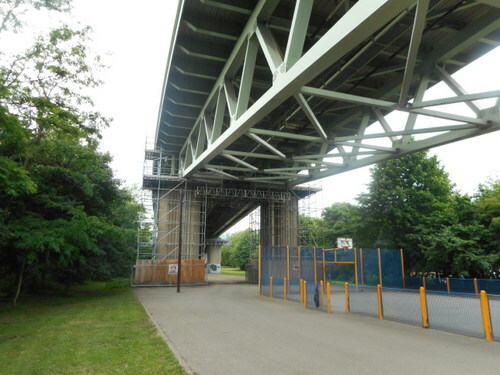 Even though that ghastly M4 cuts the grounds in half, the noise does not unduly affect the peace of the manor house and our walk through the woodland park and lakeside became a very pleasant excursion transporting us miles away from the hurley-burley of this busy part of London. 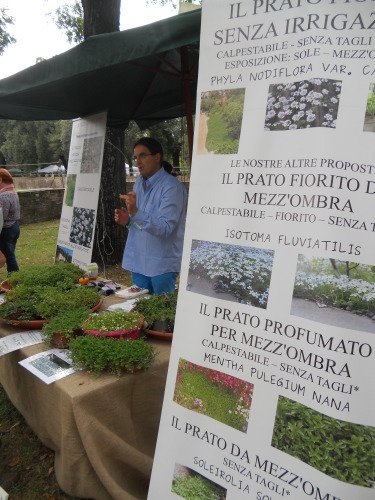 Lucca has two major gardening festivals every year. The first is called “Verdemura” and takes place at the beginning of June. (I’ve described this festival at http://longoio.wordpress.com/2014/04/06/luccas-green-walls/). 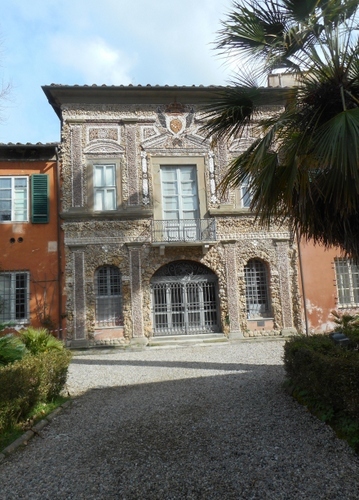 It’s located at the northern end of the walls near porta Santa Maria. The second, and larger festival, is called “Murabilia” and takes place at the start of September. It’s held in two bulwarks at the southern part of the city walls – probably a superior place since they are near the city’s charming botanical gardens (which are free to holders of the festival’s admission ticket.) 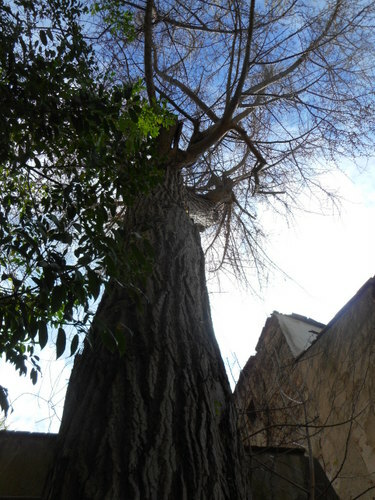 Both gardening festivals have stunning locations on the beautiful tree-avenued walls of Lucca which are now just over five hundred years old. I far prefer these smaller gardening and flowers festivals to the huge and overcrowded events in London, of which the Chelsea Flower Show is the prime example. Why frequent those happenings if one is unable to see exhibits clearly because of the pressing crowds? The same could be said of other events in that city, such as the exhibitions at the Royal Academy – they may be marvellous but what is the point of going if one’s view of the pictures is continually obstructed by throngs of people? Lucca’s garden festivals are just the right size not to cause exhaustion and contain the right amount of variety not to be overwhelming. The number of ancient and threatened species of fruit was remarkable and one stand was dedicated to their preservation. How boring life would be if we were just reduced to eating little more than the golden delicious variety of apples? The orchid exhibition in the botanical gardens was stunning. Our metal avian friends from Africa were back in all their mischievous glory. Cacti were in sufficient variety to please everyone. Murabilia lasts until 7th September so hurry if you want to see it! We also had time to take in the last day of an exhibition at the nearby Villa Guinigi on the excavation of a sixteenth century pottery kiln which has taken place near the San Donato gate (the one housing the tourist information office). The exhibition was very well laid out with accompanying, decent English translations describing what was found and how it was made. Batch processing of pots using horizontal and vertical containers and the technique of graffito to produce patterns on the ceramics were excellently described. 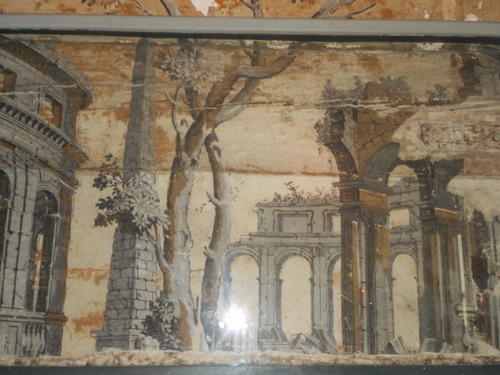 The Lucca pottery, however, failed to compete satisfactorily with the far larger establishments at Faenza and folded up to be replaced by a glass works. It’s a pity this was the last day of the exhibition and we were probably the last visitors to view it. I do hope it can be displayed again in another venue soon. The day was humid and slightly overcast, making it not too uncomfortable to take in the pleasant sights Lucca offered us yesterday. The couple of light showers ensured that the exhibits themselves were looking at their best. GUEST POST BY ALEXANDRA PETTITT Making a Duck-pond. The owner’s son was truly grateful of our purchase and bowed to the Buddha with reverend hand gestures in gratitude I suppose for our presence it was quite moving. I will indeed ask Francis to post the progress I have finished the job but I must say what with the heat et. al. It was a huge project to undertake! 1. Get your pond shape. 2. Decide where to place it and dig a whole greater than the size and shape of the pond. Remove all sharp stones and stones generally. 3. Fill the base of the dug-out area with fine sand. 4. Place the pond shape on top. 5. Fill with some water and check for levels with spirit level. 6. At this point job was left. Next morning it was filled with rain water and the ducks were already happily swimming and enjoying their new pond! 7. However, the plastic pond distorted one side due to the weight of the water bearing down on it so all water had to be removed and saved. 8. Major job now ensued to collect as much sandy or clay soil as possible as well as nice loamy earth. 9. Then all the areas had to be packed with this mixture of soils to ensure no more distortion of the plastic pond. 10 Finally, fill the pond again with rain water. I nearly forgot that the actual final part is to create a nice rockery around the pond edge and plant ferns and other plants. Job done photos to follow!